Find hotel near Banff Visitor Information ..
Banff Visitor Information Centre is replete with heaps of information that most tourists would be keen on understanding. The information at the center assists with discovering the unknown in the city of Banff. Maps and instructions at the center helps tourists move about in the city like confident locals. The information center has a wide display of surrounding attractions and provides with relevant information about the culture in the city. 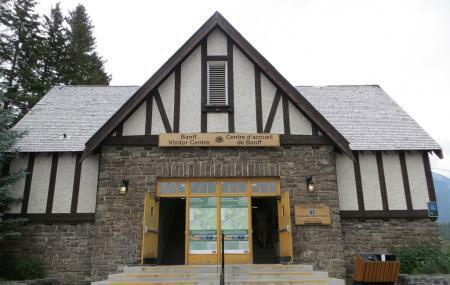 How popular is Banff Visitor Information Centre? People normally club together Vermilion Lakes and Bow Falls while planning their visit to Banff Visitor Information Centre. Staff were knowledgeable and helpful, and all merchandise sold supports Parks Canada. Great three-hour free parking in the centre of town. Stop by for maps, activity flyers, bookings, and info. Everything Banff was amazing. I wish I lived closer so I could visit more often. Loved the Rocky Mountains and how they were everywhere. The visitor Centre was helpful in pointing us in where we should go to see the best sights. Friendly and helpful information centre with washrooms (in case you need them). If you have kids, make sure you ask for the bear paw stickers. It is a great place to get maps but don't expect to talk to staff. Many people want to ask in person, so if you wait to talk with staff, you will just waste your time for traveling. Excellent customer service. The staff was very knowledgeable and helpful. She helped us find a snowshoeing trail and discussed events for New Year's Eve.